While we understand that a shed kit may be the best choice for some people, we highly recommend a custom built shed—and here’s why. Promising a brand new shed for the lowest possible price, kits are a popular storage solution at home improvement stores. They sound like an unbeatable deal because they guarantee a great storage option in exchange for just a few hours of work and a fraction of the price of a custom built shed. But are shed kits too good to be true? While we understand that a shed kit may be the best choice for some people, we highly recommend a custom build shed—and not just because we make them. We truly believe that they offer the best protection for your possessions. Here are a few reasons why we believe sheds from manufacturers are better than DIY shed kits from home improvement stores. #1. Shed kits have shorter lifespans than custom built sheds. Home improvement store shed kits like those from Home Depot and Lowes will likely last between 5-10 years. The reason some sheds last 30 years and others only last a fraction of that time comes from the quality of the materials used and craftsmanship with which is it built. As with most everything else, you get out of the investment what you pay. Shed kits have shorter lifespans because they are made with cheaper material than custom sheds. Companies that make shed kits achieve their low price by using the cheapest materials on the market for their shed siding, lumber, flooring, and roofing. Siding. The most common hardware store sheds are wood or plastic. Wood siding, if not treated correctly, is susceptible to mold and rot. Plastic siding, on the other hand, can crack in direct sunlight. Some shed kits offer vinyl siding. The material is often faux-vinyl rubber siding which expands and contracts in the sun leading to severe cracking and leaking. Lumber. Prefab shed kits tend to use lumber that isn’t properly pressure treated and is mass produced and sold in the parking lot of a big box store. If the lumber isn’t adequately treated, it can cost the integrity of the building. Flooring. The cheapest shed kits don’t come with flooring. In many cases, a separate shed floor will need to be purchased and installed. Roofing. Most prefab shed kits use 3-tab shingles, also called a composition or fiberglass shingle. Compared to architectural shingles, 3-tab shingles are more susceptible to leaks and are more likely to blow off in a storm. If this happens, the shed’s interior could be compromised and the items being stored inside could become ruined which defeats the purpose of having a shed in the first place. #2. Shed kits are not customizable like custom built sheds. DIY shed kits are convenient and may save you some money upfront, but due to the low-grade materials used, there’s a higher probability that they may leak or break causing damage to the items stored inside. On top of that, their limited options mean minimal customization. Options. While you may have a choice between roofing colors, a couple of siding options, and if you’re lucky, flooring, chances are good that you will not have many choices within those options, and they will not be from recognizable brand names. Add-ons and upgrades. Kits come with a few simple embellishments. Features like flower boxes, trim packages, and wall insulation are not usually available. Additionally, if you want to upgrade to pre-hung steel doors, double-paned insulated windows, or if you want to add a dormer or second vent, you’re likely out of luck. Color. Wood shed kits don’t usually come painted. You can pay extra to hire a handyman service, or you can tackle the painting on your own. If doing it yourself, you’ll need to find out which paint is best for the exterior of a building. #3. Shed kits are challenging to build. DIYers and amateur craftsmen may like the idea of building a shed using a kit. However, there’s always the risk of something not fitting correctly or of something being damaged in transit. To complicate matters, if you force something to work or put pieces together incorrectly, you could cause irreversible damage. On top of all of this, it generally takes a day to put together a shed kit. #4. Custom built sheds are better quality and tailor-made. We believe that a storage building is an investment. You’ll get out of it what you put into it. Many custom shed manufacturers offer high-quality custom sheds that can be delivered to your property or built on-site by an experienced construction team. The benefits of buying custom are many, but here are a few. Quality materials. Since a shed serves the purpose of protecting your items from the elements, the material used to construct it need to be tough and dependable. Trusted brands like LP, CertainTeed, and Sherwin-Williams have stood the test of time and proven to be durable and attractive. No shortcuts. When high-end architectural shingles are applied, top-notch siding is installed, ultra-durable pressure treated skids & joists are put in place, and skilled craftsmen are doing the construction, you can be sure there are no shortcuts taken. Most reputable custom shed manufacturers take pride in their products and have high standards. You can be sure that what you get has their stamp of approval on it and that it will have structural integrity. Delivery. Most custom shed manufacturers will deliver your new shed and remove your old one which can save you hours of time and prevent a massive headache. Tell the delivery crew where you want your shed placed, and they’ll do all the work. So, shed kit or custom built shed? While the big box home improvement stores might seem like a convenient place to buy a cheap shed without a wait, you’re not investing in a long-term solution. Our recommendation is to buy a storage building that’s guaranteed to withstand the elements and last a long time. A high-quality custom shed should not only meet but exceed your needs and expectations. When you buy a premium custom shed from Dakota Storage Buildings, you can expect to get a storage building that keeps the items stored inside safe and dry for a lifetime. Talk about a great investment! And shopping for a custom shed has never been easier or more convenient. Our online 3D Configurator Tool allows you to create your ideal backyard shed from the convenience of your home. You can zoom, rotate, switch colors, and change styles at a click of the mouse. Imagine swapping out windows, moving doors, and changing colors on your computer, tablet or smartphone. 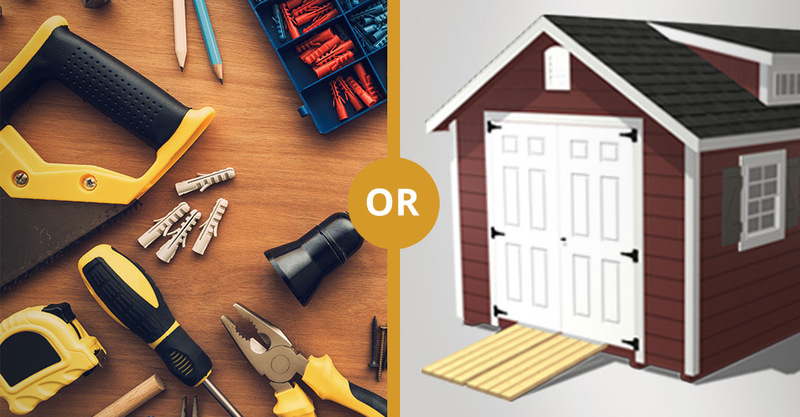 The perfect shed or garage is waiting for you! Start by picking one of our storage building packages or customizing your own from top to bottom. It’s our mission at Dakota Storage Buildings to make affordable, high-quality buildings that meet storage needs and exceed expectations. Explore some of our storage buildings in person at any of our South Dakota or Minnesota shed display lot locations.